A favorite summer drink has always been Cherry Limeade. I recently took matters into my own hands (rather than a Sonic employee’s) and made a simple recipe for Homemade Limeade . That blended with sweet, frozen cherries and a large scoop of crushed ice was easily turned into Cherry Limeade Slushies. Then I got to thinking how yummy those flavors would taste in popsicle form on a stick. With some leftover limeade and a large bag of frozen cherries I did just that! Need an even simpler sweet fix? Substitute a high quality all-natural store bought limeade, rather than making your own. If you use dixie cups or other glasses, place a small sheet of foil over top of the glass and insert a popsicle stick through the center. For ice cube trays, cover the whole tray with foil and insert the sticks. The amount of cherries added will vary depending on your blender. Some can handle a higher fruit to liquid ratio than others. Experiment to find what works best for you. 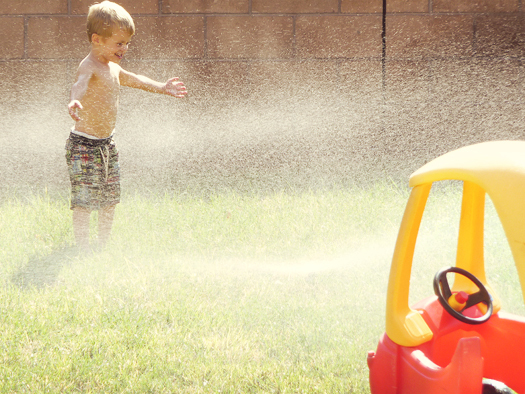 Do you have a favorite frozen recipe for keeping cool in the summer? I’m on the lookout for low-sugar frozen concoctions (any advice?) In the meantime, these will be an occasional treat for us. Otherwise, I think we’d eat popsicles twice a day in the summertime! I’m going to give these a whirl with my stevia, since we are always watching sugar intake in my house, too. I love this flavor idea! My son (RecipeBoy) made some fresh raspberry popsicles last month. They were a bit hit! Just linked to it in my blog post for today. Thanks for sharing. Perfect timing, as the heat of summer has finally arrived here in Southern Ontario. These look wonderful! Thanks, Katie! My husband loves cherry limeade! I will have to make the drink, the slushies AND the popsicles! oh Katie these sound fantastic! we have not made any frozen treats yet this year, and with our temp over 100 today, I think it’s time!! These sound really good. Any suggestions on where to find frozen cherries (in Canada)? I’ve never seen them, Kirsten. I would pit your own and flash freeze them on a tray. You’re sure to get the maximum cherry flavor that way! I get frozen cherries at Costco (not sure if that is an option in Canada) but I see them in the grocery store too near the frozen fruits. In areas where cherries are harvested, many places will offer them in large pails. Sometimes you have to call around to independent produce stores, but we can get them in frozen pails at Zehrs, too (Southern Ontario). These look so so good. I want one right this very minute. So very lovely! I could eat about 5 of these right now! Such refreshing popsicles and pretty photos too! I love lime, especially when it’s brightening up cherries or raspberries. Great recipe, Katie. I haven’t had popsicles in a long time. Why do we think they are only for the young? Don’t the young at heart count? My grandson and I just yesterday were making some popsicles and I was saying we have to change these up and lets get a little fancy. So here I am surfing and getting recipes to try for our next popsicle making. Thanks for sharing so much. we’ve been making lots of frozen treats this summer & we are for sure going to add these to the list! 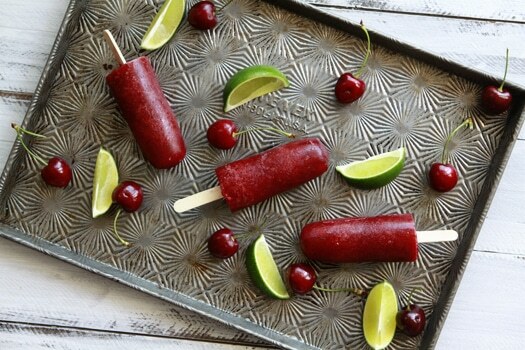 I love the flavor combination and this Cherry Limeade Popsicles look absolutely delicious! A great summer treats for the kids and kids at heart. We will definitely love it! A must try frozen delight! I just made up a batch and can’t wait to give them a try. I was wondering if you had tried this recipe with raspberries instead of the cherries. I have a bag of raspberries in the freezer and would like to try that combo but wasn’t sure if the proportions would be different with raspberries. Thanks! mmmm yummo!! and i LOVE the backdrop ovenex baking pan – i have other pieces but not a full pan like that – jealous! !